Each and every component is checked and measured against known specification and value so Reference components can be passed as within the design tolerance for the grade of Reference Series accreditation. We know how important each components tolerance can be within the audio chain and the tightest of tolerance makes a significant difference and qualifies for Reference grade Status. This is an accomplished audiophile model with a long history of satisfied users around the world. We have added a host of additional features with this latest Mk4-SR version. An additional 4 rotary controls and 6 digit display is the obvious and immediate change visually. This, however, is just the beginning of the additional user features available with this most updated version. Twin RCA inputs to enable augmentation of bass frequencies within an audiophile grade system from line-level connection as well as the legendary High-Level input so unique to MJ Acoustics. RCA Input for LFE and RCA input for Centre channel connection. All inputs can be used simultaneously and we encourage you to do so when installing in a Home Theatre system. You can augment the bass for speakers connected to the front Left & Right, Centre channel and the LFE source. A true enveloping soundstage can be achieved from a single subwoofer that makes all speakers in the system sound as though they are large floor-standers. 6 Inputs all at the same time! No other subwoofer can do this. Additionally, power is increased from 120watts to 150watts. Launched back in 2002, it has been awarded multiple accolades evolving into an important part of the MJ Reference Series line-up. It is easy to set up and easy to position in the room and available in many different finishes. We can even provide a specialist bespoke paint service and veneer layup to give you a truly unique product that simply cannot be beaten for its size, features and audiophile musicality by any other subwoofer in the world. With the addition of DAMP 3rd Generation which incorporates the latest iOS and Android Smart Remote control, you have a subwoofer that is so much more than just a producer of bass. 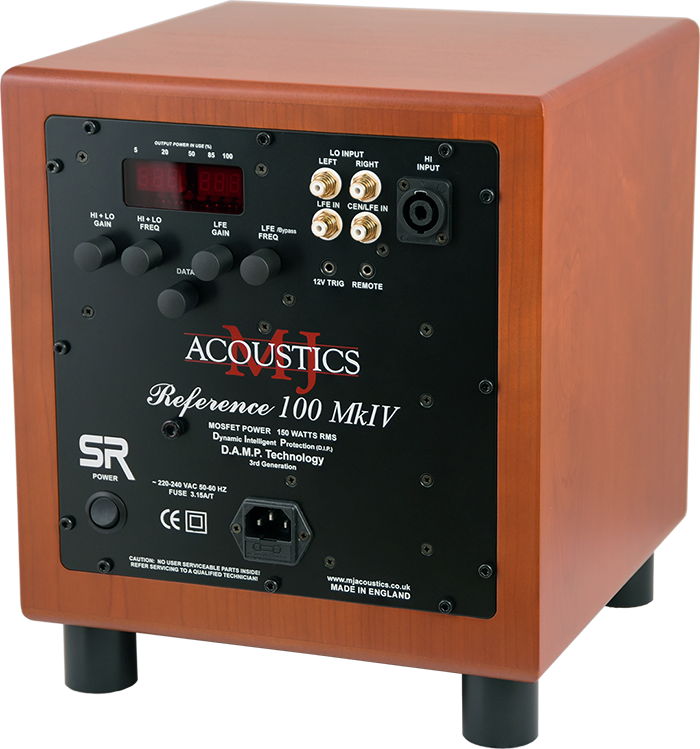 The Reference 100Mk4-SR will prove to be the linchpin of your music setup. Diminutive in size, Reference 100 Mk4-SR packs a punch equal to subs twice its size, yet it goes almost visually unnoticed due to its small 280mm square cabinet size. Loaded with a 250mm long-throw sub-bass driver, and tweaked High-Current power amplifier, the Reference 100 Mk4-SR is now better valued than ever before. It even comes readily equipped for line-of-sight IR remote control and remote eye receiver option to make recalling one of the 4 user-presets an absolute breeze. For those of you that have access to a smart device like an iPod/iPad/iPhone/Android Tablet we have added the exciting feature set of “Smart Remote” this is a specially developed out of sight remote control that puts at your fingertips the ability to dial in the settings from the listening position in a way that could never have been achieved before. 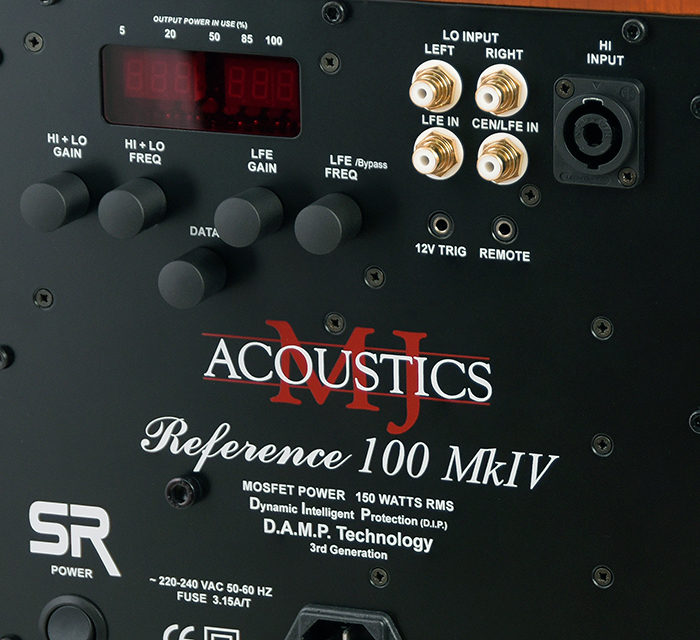 Totally unique to MJ Acoustics and developed over the past 4 years by our in-house programming team, it really is a feature set that makes it hard to comprehend how the setup was achieved without it. Ask your local dealer for a demonstration today and experience the missing link to your system! When a subwoofer sounds this good, there’s no alternative. The best 100% British Subwoofers available.